One of Cajun music’s best kept secrets is a secret no more… Ray was raised during the 50s & 60s, or the “Dance Hall Era,” of South Louisiana. He developed his accordion skills while performing with many of the pioneer artists now studied by students of Cajun music. In 2004, they were awarded the Best First Recording of the Year Award by the Cajun French Music Association for the album, Pour les bons vieux temps. Ray Abshire’s third effort in a decade is his most dancehall-centric yet, due to a fuller band sound with sons Brent and Travis on acoustic guitar and bass and former BeauSoleil accordionist Jimmy Breaux behind the traps with an unfaltering downbeat. Because of Abshire’s longtime association with the Balfa Brothers and the unsung Robert Bertrand, the accordionist has always been influenced by the fiddle’s rich expression, which explains the presence of twin fiddlers Kevin Wimmer and Courtney Granger who provide many of the disc’s celestial moments (“Cher Cherie”). Though it may appear as just another traditional album to those unwilling to peek under the covers, Abshire is not without subtle innovation. Several tunes, such as “Dewey & Nathan’s Waltz,” “Good Time Two-step,” and “Carolina Blues” are resurrected from obscurity with some arrangement modifications. While several selections are associated with the Balfa Brothers, cousin Nathan Abshire and Bertrand, Abshire adds three originals to the repertoire. “Blue Moon Blues” has become a dancer’s favorite since it feels like it’s about to explode but never does. Even its title is traditionally based since, historically, songs were named after nightclubs. Additionally, Abshire and Granger alternate vocal duties that provide a pleasing contrast between Abshire’s quasi-Cajun classic weepy style and Granger’s velvety tone that has gotten deeper over the years. Throughout these 18 tracks, the group never breaks a sweat with its masterful flow of songs. Peppy two-steps downshift into majestic waltzes before ramping up again; giving the impression that Abshire and crew can do this all night long. As soon as you hear the lively accordion of “Chere Petite,” the first track of “Arrete Pas La Music,” your feet will start dancing. 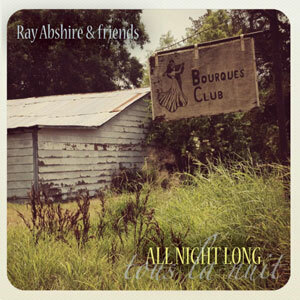 This fine collection of traditional Cajun music, headlined by Ray Abshire, has it all. Fine singing, lively accordion playing and sweet fiddle playing woven together in tunes from two steps to waltzes. 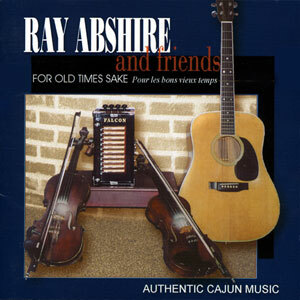 Ray Abshire learned his music from the great Cajun masters of the 50’s and 60’s. A member of the Abshire musical family, he played with the Balfa brothers at the first Cajun music festival in 1974. His mastery of the accordion is evident on every track, from lively tunes like the “Bosco Stomp” to slow waltzes like “J’ai Pleure.” His impeccable timing and attacking drive create a full, rich sound in every song. Courtney Granger adds fiddle solos on several tracks, from tender waltzes to driving two steps. Granger finds that spot between the harsh sound of a folk fiddler and the overly sweet sound of a classical violinist, the spot that combines strong drive with piercing sweetness. The vocals of both Granger and Abshire sparkle with clarity and energy. The tight vocals of Abshire’s classic Cajun high tenor voice drive the music as effectively as his accordion playing. Granger, also a tenor, does a fine job on several tracks and is especially effective on the more tender lyrics of the waltzes. If you like Cajun music, you will love this CD. Allons Danser! 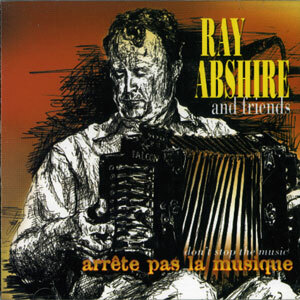 Two years after their wonderful award-winning “For Old Times Sake”, Ray Abshire and friends have a brand new CD out on Swallow. With the same friends (Courtney Granger, Kevin Wimmer and André Michot), Ray (and his wonderful sounding Falcon accordion) presents you 18 authentic Cajun songs again. This one is at least as good as the first CD, which already was a brilliant disc. Again two-steps and waltzes are following up each other with musical perfection combined with full Cajun spontaneity and great vocals by Ray Abshire and Courtney Granger. All those beautiful elements of Cajun music, that give you that divine feeling while hearing it, are present! Six new tracks (2 waltzes, 2 vocal and 2 instrumental two-steps & all great stuff! ), were written by Ray Abshire himself. The well-known traditionals are the instrumental “Acadian Two-Step” (that used to be Nathan Abshire’s theme song), “Bosco Stomp” (sung by Courtney) and “Eunice Two-Step” (sung by Ray Abshire). Ray also demonstrates his wonderful vocals on Robert Bertrand’s “Valse de Gueydan”, Canray Fontenot’s “Tes Parents Veulent Plus Me Voir” and the traditional “Basile Widows”, while Courtney is also doing a wonderful vocal job on Aldus Roger’s “Fais Attention, C’est Mon Coeur Qui Va Casser”, Iry LeJeune’s “Valse de Cadien”, Dewey Balfa’s “J’ai Pleuré”, Adam Hebert’s “J’aimerais Connaître” and Joe Falcon’s classic “Allons A Lafayette”. Nathan Abshire’s (Ray’s cousin, for those who didn’t know already) “Shamrock” is a great instrumental to finish this potential award-winning CD. All lyrics are included! Thanks a lot for this great music, Ray and friends!